The Pittsburgh Steelers will be without starting right tackle Marcus Gilbert for the next four games, as he was suspended by the NFL for violating the league’s performance-enhancing drugs policy, as reported by Ed Bouchette of the Pittsburgh Post-Gazette. 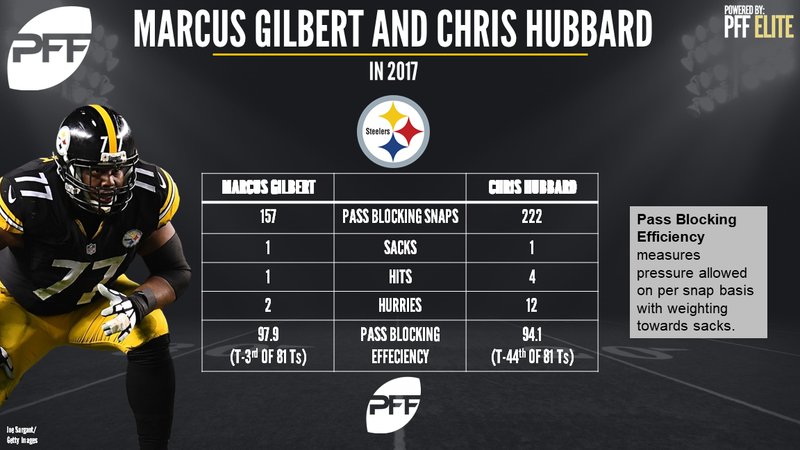 Gilbert has been limited to only 278 snaps this season due to a hamstring injury, forcing swing tackle Chris Hubbard into action throughout the 2017 season. Gilbert’s 80.2 overall grade ranks 11th among tackles and is the second-highest on the Steelers’ offensive line behind the highest graded guard in the league, David DeCastro (90.8). The Steelers will really notice Gilbert’s absence when protecting Ben Roethlisberger down the stretch. Gilbert had yet to be penalized or allow a sack until the Week 11 matchup against the Tennessee Titans. Prior to his suspension, he was tied for the third-highest pass-blocking efficiency among tackles in the league at 97.9 while only allowing four total pressures this season. Hubbard has spent time at left tackle, right tackle and as an extra offensive lineman this season, but 415 of his 450 offensive snaps have come at right tackle. He has improved after allowing a pressure every 11.5 pass blocking snaps in Weeks 2-5 by only allowing a pressure once every 18 pass-blocking snaps since Week 6.